This is the continuation of a series of patterns to make a crocheted version of the dice used for the classic Dungeons and Dragons, along with most role-playing games. 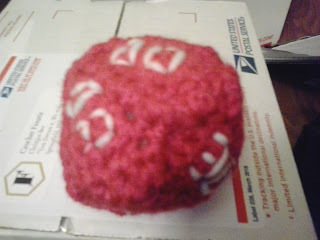 This is D10 Percentile dice. The dice can be made in any color. The color for the numbers will, of course, be determined based on the color of the dice—white with dark dice color or black with light dice color. Finish off. Weave in ends. Using white/black, embroider numbers on DICE SIDES. Sew DICE SIDES together stuffing before closing. Dungeons and Dragons are copyright Wizards of the Coast, a subsidiary of Hasbro, and their respective creators.